October 19, 1987 — October 19, 2009: Deja Vu All Over Again? TIME magazine cover December 1, 1986. What has really changed on Wall Street? Twenty-two years ago today the equity markets crashed. The Dow Jones Industrial average cratered by a whopping 22%!! Have our markets, economy, and financial regulatory oversight progressed, regressed, or is it merely “deja vu all over again?” Well, with the markets up 1% on the day and 50% off the lows in March of this year, clearly today is vastly different than 22 years ago, right? Honestly, I would maintain that from a grand perspective very little has changed. Why? How? As much as we may have made technological progress on a number of fronts both on and off Wall Street, the fraud implicit in the illegal use of information is still very much central to the corruption that occurs on Wall Street. Back in the mid to late ’80s, insider trading activity was rampant in a number of hedge funds and leveraged buyout activities. 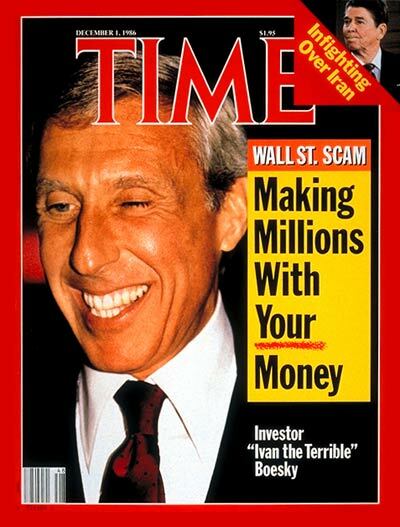 The so-called king of Wall Street at that time was Ivan Boesky. As it turns out, Boesky was nothing more than a common criminal involved in a massive insider trading scandal. When Boesky was confronted with the evidence of his criminal activities, he turned on his cronies and sang like a canary. In relatively short order, some of Wall Street’s titans fell like dominoes. Who were some of these titans? Dennis Levine, Robert Freeman, Martin Siegel, and Michael Milken. These masters of the universe were nothing more than white collar criminals. Fast forward to 2009. The markets are rebounding and Wall Street is back to ‘business as usual.’ In a manner of speaking, the ‘business as usual’ is no different than the business that occurred back in the ’80s. What business is that? Insider trading. I am sure there are individuals going home today wondering if their illicit activities will be, or already have been, detected. Fraud driven by greed is a timeless activity made only more prevalent by an industry which has corrupted itself by diluting its regulatory oversight. October 19, 2009 . . . deja vu all over again. Are we so focused on the beauty of the rolling surf that we have become blinded by the dangers of the shifting currents? No doubt!! Washington and Wall Street would have it no other way. My wife and I attended a friend’s wedding on the outer part of Cape Cod this weekend. We had a few hours between the church service and reception. While enjoying a refreshment at a local waterside inn, we soaked in the beauty of the seaside setting. 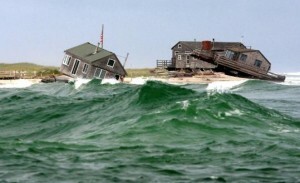 Little did I know, but along that very coastline the day before, two substantial homes had literally washed away as their foundations had been totally eroded by shifting tides. The mission of Sense on Cents in navigating the economic landscape is to redefine the ‘game’ and the ‘rules’ so people can truly enjoy the beauty of the waves while fully appreciating the dangers of the shifting currents. At this point, Wall Street is looking to return to ‘business as usual.’ Meanwhile, the programs and policies of the Obama administration are not only going with the ‘current’ that severely damaged our economic foundation, but are also strengthening that current. What do I mean? Recall that after the market crash of 1929, the two driving forces that pushed our economy and country into The Great Depression were higher taxes and increased protectionism. While Obama campaigned on targeted tax increases for the highest income earners, there is no doubt in my mind that our entire economy will be hit with higher taxes. These tax increases will come via formal tax legislation and also via increased costs passed along by industries impacted by new legislation. The formal tax increases for every wage earner in our country paying taxes will result from anemic economic growth. Obama as much admitted last week in a Bloomberg interview that higher taxes across the board may be a necessity. I highlighted this prospect in writing, “The Taxman Cometh”. Jack Welch stated the other day, “we’re going to have huge tax increases” given the enormous spending programs being launched by the Obama administration, in conjunction with little to no economic growth. How often have you heard a person answer in that fashion when asked why something is done a certain way? A lot, I’m sure. Why? Change is stressful. Adjusting to change is perhaps even more stressful. 1. FINRA: at a time when our economy is screaming for increased transparency and accountability, this Wall Street self-regulatory organization has not yet released its 2008 Annual Report. Why? I view it as unacceptable. The facts, figures, and transactions for 2008 are in the books. A mere accounting should be simple and straightforward. With the exception of Bloomberg, do you even hear of FINRA from major media outlets? Rest assured, I will review the FINRA Annual Report thoroughly, with particular focus on their investment activities, and question them as need be. At some point, perhaps, the mainstream media may want to engage them as well. 2. Wall Street: why do banks so badly want to pay back TARP funds? The primary reason is compensation. In fact, in recently speaking with a number of colleagues on the street, banks are again paying “guaranteed” contracts to recruit personnel. Certain of these banks remain flush with government funds. What propels banks to do this? Because they can, meaning there is no transparency or accountability. Additionally, they do not want to “cede turf” to startup firms which can offer opportunity but no guarantees. In layman’s terms, the large banks are flexing their muscles to impede smaller organizations from gaining a foothold in their ‘hood.’ Fair and open competition is one thing, but using taxpayer funds to pay guaranteed contracts is an entirely different issue. 3. Banking: why do banking industry execs feel compelled to maintain the perks of prior years? Ego. The Wall Street Journal highlights CEOs of Bailed-Out Banks Flew to Resorts on Firm’s Jets.